Be the first to share your favorite memory, photo or story of Sheryl. This memorial page is dedicated for family, friends and future generations to celebrate the life of their loved one. Sheryl L. Abraham, 73, of New Cumberland passed away peacefully in her home on Tuesday, April 9th due to believed heart failure. She was born February 11, 1946 in Cleveland, OH to the late Carl and Alice (Blanchard) Loper. After growing up in Ohio, Sherry graduated Collinwood High School, and then attended Ohio University where she studied elementary education. Upon graduation she was married to Tom Abraham and moved around the country for several years with his job before finally settling down in Lewisberry, PA and raising a family. 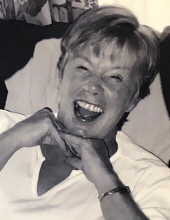 She went by “Sherry” more than Sheryl… it was fitting not just because of the famous song that bears her name, but because listening to upbeat music and dancing were some of her favorite things to do, second to taking amazing care of her family. She was full of love for so many, and enjoyed nothing more than supporting her three boys in all that they did. She wore out the words “I love you” and was wonderful at making people around her feel good… and a fierce defender of those close to her. Quick to laugh and never one to shy away from a good joke, all who knew Sherry were lucky to have done so. She will be terribly missed. She is survived by three sons, Tom C. of Mechanicsburg, Steven M. (Kristen Marie) of Purcellville, VA, and Joseph D. (Christine) of Los Angeles, CA; spouse, Thomas J. of Fort Myers, FL; sister, Linda Zilke (Walter) of Madison, OH; and six grandchildren, Michael and Katie (their mother Kristie Dionne of Camp Hill) Gage, Dane, Cole and Ty. Viewings will be from 5 to 7pm Tuesday April 16th and again 10am to 11am Wednesday April 17th with funeral services immediately following at the Parthemore Funeral Home in New Cumberland. Burial will take place on a future date in Rolling Green Cemetery, Lower Allen Twp. To send flowers or a remembrance gift to the family of Sheryl L. Abraham, please visit our Tribute Store. "Email Address" would like to share the life celebration of Sheryl L. Abraham. Click on the "link" to go to share a favorite memory or leave a condolence message for the family.